Alumni Stadium is a football stadium located on the lower campus of Boston College in Chestnut Hill, Massachusetts, approximately six miles west of downtown Boston. 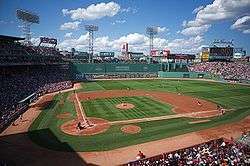 The stadium lies within the city limits of Boston, although its postal address is Chestnut Hill. It is the home of the Boston College Eagles. Its present seating capacity is 44,500. Alumni Stadium's south façade, facing Beacon Street. 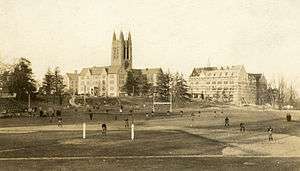 Alumni Field, Boston College's first stadium opened in 1915 and was located just south of Gasson Quadrangle, on the site of the present Stokes Hall, a newly-built academic buildings for the humanities that opened in 2013. Before the building of Stokes, the area was known as The Dustbowl, a nickname that originated as a description of Alumni Field in the years when it was intensely used as a practice field, a baseball diamond, and a running track. Formally dedicated "as a memorial to the boys that were" on October 30, 1915, Alumni Field and its distinctive "maroon goal-posts on a field of green" were hailed in that evening's edition of the Boston Saturday Evening Transcript as "one of the sights in Boston." The original grandstands, which could accommodate 2,200 spectators in 1915, were enlarged over the subsequent years to 25,000. 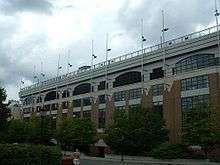 Nonetheless Alumni Field often proved too small for BC football games which were frequently held at Fenway Park, and later Braves Field, beginning in the 1930s. On September 21, 1957, Alumni Stadium opened on Boston College's lower campus. The new stadium incorporated a football field encircled by a regulation track with a seating capacity of 26,000. The dedication game, a match-up with the Midshipmen of the U.S. Naval Academy, was orchestrated with the help of BC benefactor and then-Massachusetts Senator John F. Kennedy. Kennedy, who had received his honorary degree at Commencement Exercises in Alumni Field the previous year, would return to Alumni Stadium on a number of occasions over the course of his political career, including a 1963 Convocation Address, one of his last public appearances. Alumni Stadium has hosted numerous intellectual and cultural luminaries, religious leaders and heads of state as the venue for Boston College's annual Commencement Exercises since 1957. In addition to being the permanent home of the Boston College football team, Alumni Stadium hosted the Boston Patriots of the American Football League during the 1969 season. The stadium underwent a major renovation before the 1994 season which eliminated the track and increased capacity to 44,500. Since 1998, a 65-foot (20 m)-high bubble of inflatable vinyl has covered the stadium from December to March and allowed the field to be used as a winter practice facility. The field surface itself was converted to FieldTurf before the 2004 season. In the summer before the 2005 football season, the $27 million Yawkey Athletics Center opened at Alumni Stadium's north end zone, and the logo of the Atlantic Coast Conference was added to the FieldTurf. For the 2012 season, Alumni Stadium was outfitted with new FieldTurf. As the home of the Boston College Eagles, Alumni Stadium has been the site of numerous notable moments in Boston College football history. On September 17, 2005, Alumni Stadium hosted BC's inaugural game as a member of the Atlantic Coast Conference. ↑ Oslin, Reid; Flutie, Doug. Tales From The Boston College Sideline. Champaign, Illinois: Sports Publishing LLC. p. 109. ISBN 1-58261-546-2. Retrieved September 29, 2011.